the free encyclopedia about Mormons from the perspective of faithful members. Today The Church of Jesus Christ of Latter-day Saints (sometimes referred to by the media or friends of other faiths as "The Mormon Church") has over 16 million members in over 160 nations worldwide. Currently, 163 of its beautiful temples adorn sites in North, South, and Central America, Europe, Asia, Africa, and numerous islands of the sea. There are currently 9 temples under construction and 37 temples that have been announced (not yet under construction) for a total of 209 Temples. The following temples are currently undergoing renovations: Asunción Paraguay Temple, Raleigh North Carolina Temple, Tokyo Japan Temple, Baton Rouge Louisiana Temple, Washington D.C. Temple, and the Mesa Arizona Temple. The relief and humanitarian efforts of the Church have helped bless the lives of millions around the world, regardless of faith, as it follows the example of its Living Head, Jesus Christ. Sadly, The Church of Jesus Christ is still greatly misunderstood, and many myths and falsehoods still exist. We hope that this site will provide information to those who visit hoping to gain knowledge about Latter-day Saints (nicknamed "Mormons"), either on a given topic in Mormonism or simply about Latter-day Saints in general. Articles cover topics about such things as basic Mormon beliefs, Mormon doctrine, Mormon history and leadership, temple work, family life, Mormon literature, controversial topics, and Church organizations and humanitarian efforts. The Book of Mormon is a companion to the Holy Bible. Like the Bible, it is a religious text used by the members of The Church of Jesus Christ of Latter-day Saints which serve as a second witness of Jesus Christ. 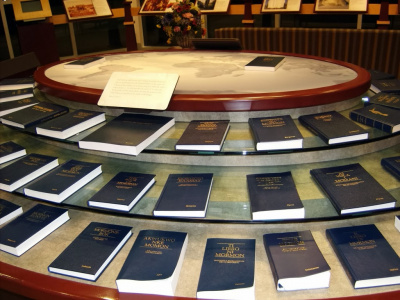 The Book of Mormon resembles the Bible in that it contains a mixture of stories and sermons recorded by earlier prophets to help us learn about Jesus Christ and His dealings with mankind. It contains the records of several early groups of people who came from the Holy Lands to the American continent. Those who were righteous were led by prophets, just as were the people of the Bible. These prophets recorded the revelations they received about Jesus Christ, their testimonies of Him, and at one miraculous point, their visitation from Him. There are more than 30,000 members of The Church of Jesus Christ of Latter-day Saints in Italy, with seven stakes and two missions. The Rome Italy Temple will be the first LDS temple constructed in Italy and the 12th temple in Europe. When completed, the Rome Italy Temple will serve members who, according to local Rome Stake President, Massimo De Feo, currently travel to the Bern Switzerland Temple if they wish to do temple work. He also said that the Church has seen a significant increase in requests for baptisms for the living and the dead, and for celestial marriage ceremonies and family sealing ceremonies which officially bind couples or families together for eternity. He also believes that many Italian members who moved away because of inadequate ways to practice their faith will return to Italy once the temple is complete. Just three years after the Saints arrived in the Salt Lake Valley, the first missionaries arrived in Genoa, Italy, on 25 June 1850, including Elder Lorenzo Snow, who would become the fifth president of the Church. Over the next three years, 221 people were baptized and organized into three branches. But most proselytizing in Italy stopped in the early 1860s in the face of local opposition and because of a request from Church leaders for Italian members to migrate to Utah. An attempt to reopen missionary work in Italy in 1900 was refused by the government. The Church was finally reestablished in Italy in 1951, following the conversion of Vincenzo di Francesca, who happened to discover a charred copy of the Book of Mormon in a garbage bin. The cover and title page was missing, and it took him years to find out the identity of the book and achieve baptism into the Church. Italians who had joined the Church in other countries began to return to Italy during this period. They attended Church with LDS serviceman stationed in Italy in various branches. By the end of 1964, Church records showed 229 members in Italy. That same year, Elder Ezra Taft Benson, an apostle who would become the 13th president of the Church, petitioned the government for permission to resume missionary work. Permission was granted, the mission was re-opened, and missionaries began to proselyte on 27 January 1965. The construction plans for the Rome Italy Temple site also includes a Stake Center meeting house (a stake being roughly similar to a Catholic diocese), a Visitors' Center that will house digitally reproduced marble replicas of Bertel Thorvaldsen’s renown sculptures of Christus and the Twelve Apostles, a Family History Center, and patron housing. President Thomas S. Monson dedicated the temple site on Saturday, 23 October 2010. He was accompanied by Church officials, including Elder William R. Walker, Executive Director of the Temple Department; Erich W. Kopischke, President of the Europe Area and his two counselors, Elder Gérald Caussé and Elder José A. Teixeira; Elder Alfredo L. Gessati, Area Seventy; President Massimo De Feo, Rome Italy Stake President; and President Raimondo Castellani, Bern Switzerland Temple President. Numerous government officials were also in attendance including Mr. Giuseppe Ciardi, vice mayor of Rome, and Senator Lucio Malan. The Rome Italy Temple opened to the public for a free public tour on Monday, 28 January 2019. The open house will run through Saturday, 16 February 2019, excluding Sundays. Following the admonition of the Master who taught, “Verily I say unto you, inasmuch as ye have done it unto one of the least of these my brethren, ye have done it unto me” (Matthew 25:40), members of The Church of Jesus Christ of Latter-day Saints actively engage in the service of their fellowmen in many areas of the world. They are also reminded of the words of King Benjamin in the Book of Mormon who exhorted, "For behold, are we not all beggars? Do we not all depend upon the same Being, even God, for all the substance which we have, for both food and raiment, and for gold, and for silver, and for all the riches which we have of every kind?" (Mosiah 4:19). "And this commandment have we from him, that he who loveth God love his brother also" (1 John 4:21). The service that they render is not limited solely to Latter-day Saints in need, but rather they stand ready, willing, and able to “lift up the hands which hang down, and [to stable] the feeble knees” (Hebrews 12:12) of anyone in their hour of need. Thus, as they perform their unselfish acts of service, the words found in the text of King Benjamin’s sermon as recorded in The Book of Mormon resonate with them. Said King Benjamin, “And now, if God, who has created you, on whom you are dependent for your lives and for all that ye have and are, doth grant unto you whatsoever ye ask that is right, in faith, believing that ye shall receive, O then, how ye ought to impart of the substance that ye have one to another” (Mosiah 4:21). LDS Humanitarian Services is a branch of the Welfare Services department of The Church of Jesus Christ of Latter-day Saints. The organization’s stated mission is to relieve suffering, to foster self-reliance for people of all nationalities and religions, and to provide opportunities for service. Throughout its history, The Church of Jesus Christ has always provided for those in need and is perhaps best known for taking care of its own members. In 1842, Joseph Smith organized the Women’s Relief Society, with a primary focus to provide “relief” to suffering members and an ultimate vision of aiding all people. During the Great Depression, the Church organized a welfare program, now administered by the church's Welfare Services Department, to help provide for the needs of its members. The Savior taught, “By this shall all men know that ye are my disciples, if ye have love one to another” (John 13:35). We show our love for one another when we are willing to follow the admonition of the Lord to feed the hungry, give drink to the thirsty, take in the stranger, clothe the naked, and visit the sick and those in prison. We are also taught that we are to visit the fatherless and the widow in their afflictions. In his timeless sermon, King Benjamin exhorted the people, “For behold, are we not all beggars? Do we not all depend upon the same Being, even God, for all the substance which we have, for both food and raiment, and for gold, and for silver, and for all the riches which we have of every kind?” (Mosiah 4:19). Members can get actively engaged in humanitarian efforts in several ways. One way that members can become involved is through service in their local community. Service in the community can include things such as cutting a neighbor’s lawn, washing a neighbor’s car, offering to run errands for an elderly person or someone who is otherwise unable to do so themselves, or babysitting for a neighbor. Service in the community might also include taking part in projects that benefit the community. Members should also seek to build community relations by being actively involved in community service projects that may be spearheaded by people of other faiths, or if they identify something that would benefit the community that has not been addressed, they should take the initiative to bring about a solution. No matter how a person chooses to serve his community, and no matter how small the service may seem, the service alone will say myriads about that person and his or her faith. Too often we notice the needs around us, hoping that someone from far away will magically appear to meet those needs. … When we do this, we deprive our neighbor of the service we could render, and we deprive ourselves of the opportunity to serve. Another way that a member can be involved in humanitarian efforts is by donating to the Humanitarian Aid Fund. 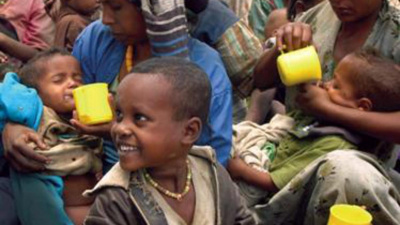 Donations can be made through a local ward or branch of the Church by filling out a Tithing and Other Offerings slip and indicating the amount on the “Humanitarian Aid” line, mailing a check, or donating online through the Humanitarian Services Giving section of the LDS Philanthropies website. Donations to the Humanitarian Aid Fund allow the Church to help people throughout the world by providing relief and ultimately helping them to become self-reliant. 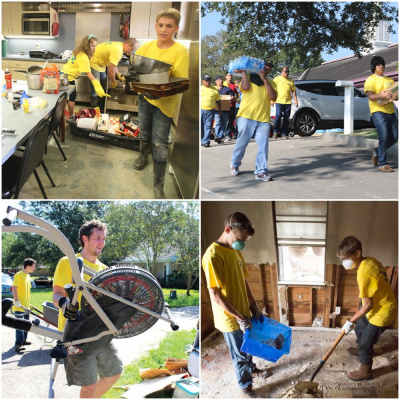 There are also many members who become actively engaged in community service or helping with relief efforts during natural disasters and catastrophes by volunteering to be a part of the Mormon Helping Hands. The Mormon Helping Hands is a program of The Church of Jesus Christ, under the direction of the Priesthood, which provides community service and/or disaster relief for those in need. The service that is rendered by the Helping Hands helps to establish the name and reputation of the Church by dispelling some of the misconceptions about the Church, and proving that Mormons are Christians who are willing to give of their time and service for the good of the communities in which they live. Emergency Response is the part of the LDS Church’s humanitarian efforts of which most people are aware. Funds and supplies in this area are used to help victims of natural disasters such as earthquakes, floods, droughts, tornadoes, and hurricanes, as well as other disasters such as wars or political unrest. Supplies in this area are gathered and stored before a crisis so supplies can be sent within hours of an emergency. Volunteers are also on call so they can be reached and organized within a few hours if needed. The LDS Church is renowned for its ability to organize its members in various regions of the world to respond to emergency and facilitate distributing goods immediately after a crisis, often before aid programs such as the Red Cross or the Salvation Army come to assist. In 2008, the LDS Church responded to 124 disasters in 48 countries. Wheelchair Distribution is another church program crucial to helping those in need. Studies estimate that only one percent of the disabled in the world have wheelchairs. For the rest, being without a wheelchair means adults cannot provide for themselves or their families, and for children it often means not being able to attend school. By providing wheelchairs to those in need, the church hopes to help people become more self-reliant which is an important tenant of LDS beliefs. Donations for LDS Church relief efforts can be made at LDS Emergency Response. The new IWasAStranger LDS refugee relief program. Do Mormons have anything to offer Africa? The Book of Mormon Musical doesn't seem to think so. North Star - A place of community for Latter-day Saints dealing with issues surrounding homosexual attraction who desire to live in harmony with the teachings of Jesus Christ and the values and doctrines of The Church of Jesus Christ of Latter-day Saints. Are Science and Faith Compatible in Mormon Religion? Click on this link to see informational videos about The Church of Jesus Christ of Latter-day Saints. Dallin H. Oaks is a General Authority of The Church of Jesus Christ of Latter-day Saints and was set apart as the first counselor in the First Presidency on 14 January 2018. He was sustained in a Solemn Assembly on 31 March 2018. He serves with Russell M. Nelson, president of the Church, and Henry B. Eyring, second counselor. Oaks and Nelson were both sustained as members of the Quorum of the Twelve Apostles on 7 April 1984. 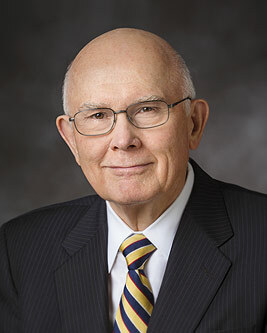 As second in seniority, President Oaks would be designated President of the Quorum of the Twelve Apostles, but with his call to the First Presidency, Elder M. Russell Ballard, who is third in seniority, was called to act in his place as Acting President of the Quorum of the Twelve Apostles. Dallin Harris Oaks was born on 12 August 1932, in Provo, Utah. He attended both Provo High School and Brigham Young High School. His father died of tuberculosis when he was only eight years old, and three years later he began working to help his mother. His first job was to sweep at a radio repair shop. It was this first job that led the young boy to gain a keen interest in radios. Before his sixteenth birthday, he had earned his radio/telephone license and landed a job working for a radio company. Soon after, he began working regularly as an announcer. It was while he was announcing a high school basketball game that he met June Dixon. They later married on 24 June 1952, while both were attending college at Brigham Young University. President Oaks worked steadily to earn a degree in accounting and later attended the University of Chicago Law School. His wife recalls him saying that although there were plenty of students at the law school who were smarter than he, none of them worked any harder than he did. He graduated with honors and earned the opportunity to serve as a clerk for Chief Justice Earl Warren of the Supreme Court. At the completion of this internship, he and his family moved back to Chicago, where he entered into a private law practice. In 1961, Dallin Oaks was called to be the mission president of the Chicago stake and was also offered the opportunity to teach at the University of Chicago. Two years later he accepted a calling as the second counselor in the Chicago South Stake Presidency. Along with his responsibilities in the Church, President Oaks had many responsibilities in other areas of his life. He was well known in his profession and had served as the assistant state’s attorney for Cook County, Illinois, as the acting dean of the law school, as a visiting professor at the University of Michigan, as a legal counsel to the Bill of Rights Committee for the Illinois Constitutional Convention, and as an executive director of the American Bar Foundation. In 1970, he was asked by the Church to be the new president of Brigham Young University. While serving as the president, he focused on academic excellence and became a spokesman for private colleges and universities nationwide as the president of the American Association of Presidents of Independent Colleges and Universities. On 1 January 1981, Dallin H. Oaks was sworn into the Utah Supreme Court, and he continued to be offered many important federal jobs. At the April 1984 General Conference, when he was sustained as a new member of the Quorum of the Twelve Apostles, President Gordon B. Hinckley also announced: "With reference to Dallin Oaks, I should like to say that while we nominate and sustain him today, he will not be ordained to the apostleship, nor will he be set apart as a member of the Council of the Twelve, nor will he begin his apostolic service, until after he completes his present judicial commitments, which may require several weeks. He is absent from the city, and necessarily absent from the conference. We excuse him." When he received this calling, he resigned from the Utah Supreme Court, so that he would be able to focus all of his attention on serving in the Church. This strong desire to serve has never wavered. Just after his calling was announced, the Washington Post’s Supreme Court reporter called him because he was a likely candidate for the United States Supreme Court. The reporter wanted to know if his new calling in the Church would mean that he would no longer be available for the position in the Supreme Court. He affirmed that he was no longer available. He further explained that even an appointment in the Supreme Court did not take precedence over the service he had just been called to give. Yahosh Bonner comes from an accomplished musical heritage and so he has been surrounded by music ever since he was a child. His mother, Debra Bonner, is an icon in the music industry and passed her love of music on to her 8 children. She is one of America’s Leading Voice Teachers with over 20 years of experience backed by a Masters of Music Degree in Voice Performance from the University of Michigan, Ann Arbor. She is a well-known vocal coach and has guided the voices of American Idol finalists. She is also a recording artist of various genres including Pop, Gospel, Broadway, Country, Classical, R&B, and Jazz, and has shared her gift as a talented singer performing in several countries. She has also been a guest soloist with the world-famous Tabernacle Choir at Temple Square. Yahosh is originally from Las Vegas, Nevada, and has lived in Arizona, Florida, New York City, Colorado, and Nebraska. He attended and graduated from, Mountain View High School in Mesa, Arizona. He is a member of the graduating class of 2004 of Choate Rosemary Hall, a highly selective, private college-preparatory boarding school located in Wallingford, Connecticut. He attended the University of Northern Colorado located in Greeley, Colorado, from 2008 to 2010 where he majored in Communication Studies, with a minor in Sociology. He graduated in 2010 with a Bachelor Degree in Communication. He is also passionate about the game of basketball, and while a student at Southern Utah University (SUU), located in Cedar City, Utah, from June 2013 to June 2014, he was the Director of Basketball Operations and Video Coordinator, as well as, Assistant Coach. He graduated from SUU with a Master of Arts in Professional Communication degree. In May 2014, he moved to Spanish Fork, Utah. He was the Head Boys Basketball Coach at American Leadership Academy which is a charter high school in Spanish Fork, Utah. He held the position since June 2014. On his Linkedin profile, he states, "I am passionate about the game of basketball. I have played at a high level and also coached at the university level. Now I have the opportunity to give back and share my knowledge with young men at the high school level." 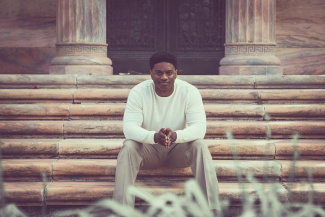 Although he is a pronounced Hip Hop and R&B vocalist, Yahosh’s love of music is deeply rooted in his love for the gospel. He states, "I look forward to sharing the gift of music that God has given me to bring the spirit into every performance." He is an active member of the Unity Gospel Choir under the direction of his mother, Debra Bonner. He has performed with artists like Alex Boyé, JTM, Mauli B, and Oyoyo Joi. He enjoys creating remakes of popular songs, adding a little of his own flair, style, and emotion to the songs that he performs. Besides being a singer, Yahosh is also an actor and currently stars in a movie about Green Flake, a Southern slave who trekked thousands of miles and rose to become a Western hero, which is being produced by his brother Mauli Bonner. He also joins several well-known LDS music artists in the music video, "Invincible," from the upcoming film. He has been married since 13 June 2009 to Vanessa Bonner and he is also a member of The Church of Jesus Christ of Latter-day Saints. Discover more seasoned and upcoming LDS artists by visiting the Mormon Music website. Find out how to create and edit articles in the Beginners Guide. Please note: The wiki has been locked down because of a recent spate of vandalism. If you have the desire to edit the wiki, or to add material, please contact More Good Foundation. MormonWiki is just getting started with only 4,177 articles and growing organizational needs. If you would like to help build an encyclopedia about Mormons, we invite you to do so after contacting us. Beginners Guide Never written for MormonWiki? An overview of MormonWiki features. Do you have a passion for blogging and sharing the gospel? Become a volunteer gospel blogger at LDSBlogs.com, where member missionaries show the world how Mormons live. 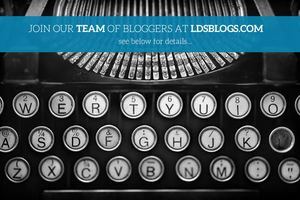 Write a weekly or monthly article for LDSBlogs and we'll handle the rest. Find out more here.